One acre of water in the four-acre park here today represents a vital part of early Providence history. The water is a reminder of the hundreds of acres of brackish water that covered the area that Roger Williams knew as the Great Salt Cove. Over time the water was drained, the land filled, and by 1898 all water had been drained to support laying railroad tracks for a booming transportation industry that supported the successful commercial businesses of Providence. Times changed; businesses declined; the downtown area languished. However, the River Relocation Project of the 1980s and 1990s brought life back to the Providence city center and with it a reimagining of the water that once ran through it. Today, Waterplace Park and the surrounding areas are home to walking paths, restaurants, concerts and WaterFire. 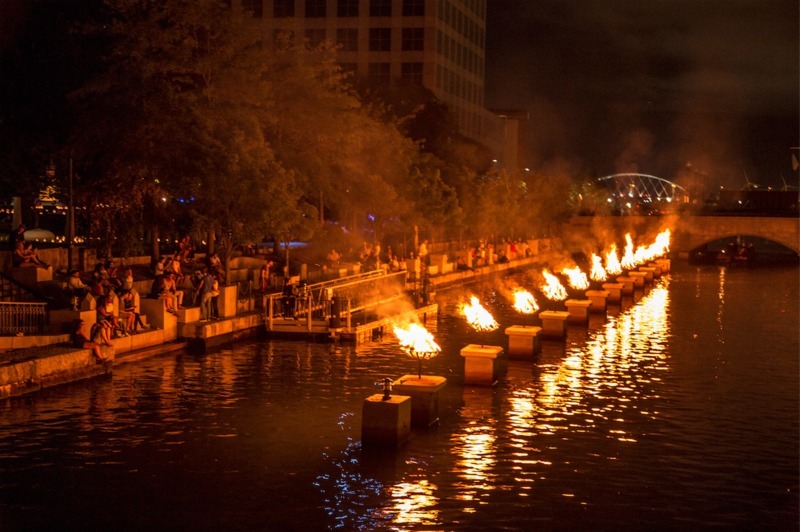 Imagine the smoky smell of bonfire fire, the crisp sound of wood crackling, and the warmth of thousands of people gathered around the rivers to witness the city’s star attraction, WaterFire. The performance art piece first opened in 1994 with eleven braziers lit on the water. By 1998, 81 braziers were installed and thousands of people a night came to see the mesmerizing performance credited with bringing pedestrians back downtown. 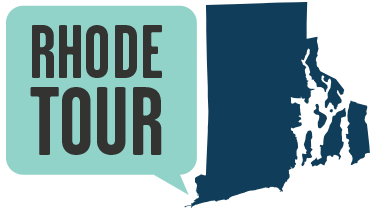 Following decades of industrial decay in downtown Providence, few people made their way to the heart of the city. Artist Barnaby Evans wanted to create a space where people could gather and walk together along the newly engineered Rivers that flow through downtown. The newly unveiled River Project was a blank canvas for Evans to work, and as a city dweller he was dedicated to making the space a destination for pedestrians. "By design, there is no point where you can see the whole installation at once, so you mingle with other citizens as you walk," said Evans. "It is designed so people can interact with each other, with the artwork and with the urban environment.” Using public art to rethink urban space, Evans made Waterplace Park a destination for locals and tourists alike. Over a million visitors have walked along the Riverwalk to see Providence’s star attraction. Barnaby Evans, founder of WaterFire, shares the history of the river relocation project and the creation of the modern riverwalk. Listen as Barnaby Evans talks about the inspiration for WaterFire and his mission in building community downtown through public art. Check out the schedule for WaterFire here: http://waterfire.org. 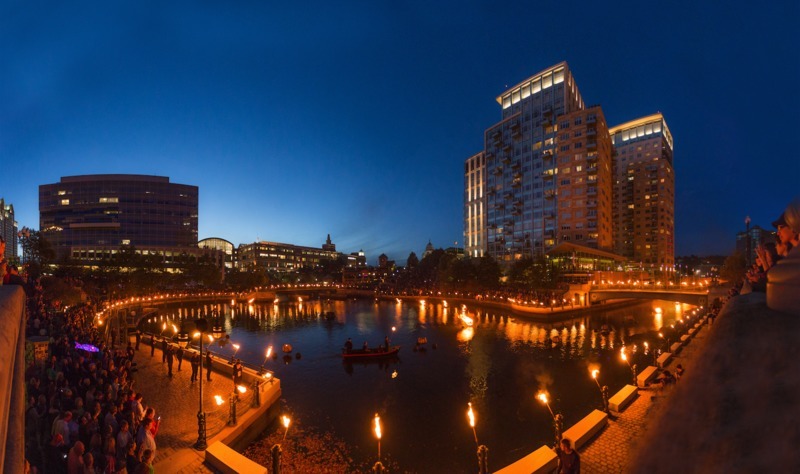 Amelia Golcheski, “WaterPlace Park and Waterfire,” Rhode Tour, accessed April 21, 2019, http://rhodetour.org/items/show/210.